The escalator delivers me up from the street into Chatswood's District Dining precinct, but it feels as if it's really whisking me straight back to Hong Kong's Mid-Levels. 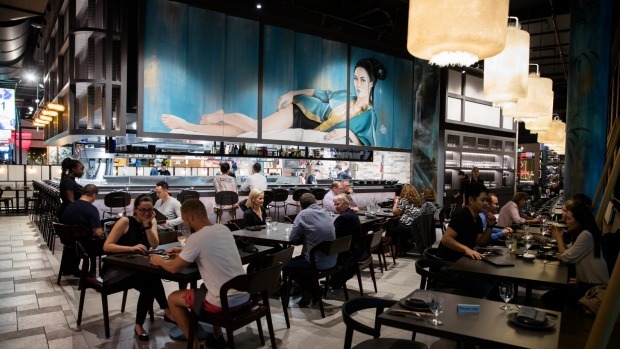 Given Chatswood's high-density crowds, pent-up traffic, the latest Chinese food franchises popping up on every corner – and the fact one-quarter of local residents were born in China or Hong Kong – this is very much "our Hong Kong". All of which helps the ambitious new General Chao to slip in quite comfortably, picking up a little of the momentum lost when Tim Ho Wan pulled out last year. Colonising one end of the precinct with its cocktail bar, 187-seat restaurant and huge central open kitchen, it has that done-to-death, retro-Shanghai teahouse vibe, with a mural of a glamorous siren reclining over the kitchen as if waiting to be fed. No doubt she'd order the giant bun ($13.50) – everyone else has. 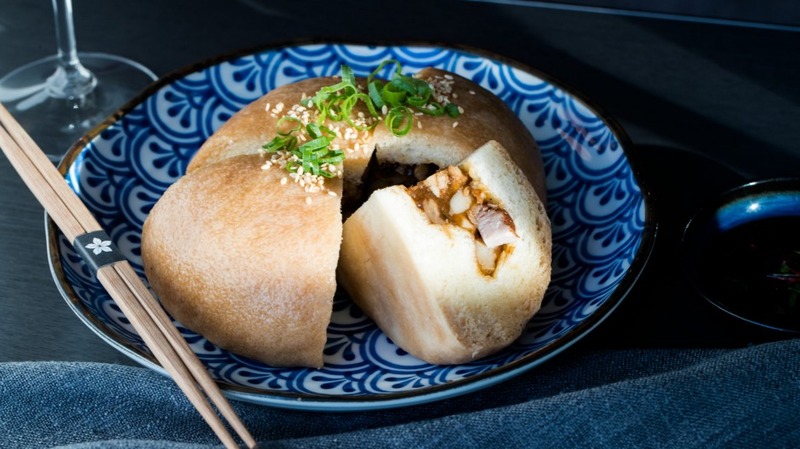 It's as big as the steamer your average-sized pork buns usually come in, stuffed with a hunky, chunky mix of shredded and cubed belly pork, chestnuts and mustard greens that's guilty-pleasure satisfying. 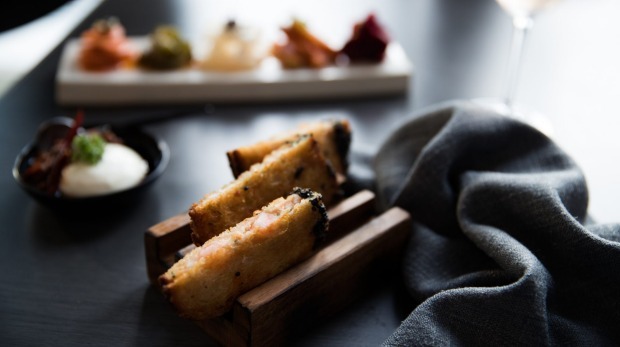 Korean-born head chef and general manager Son Sewoo has had fun putting together a modern Thai/Japanese/Chinese menu with lots of built-in novelties. Like what, you ask? Like a dedicated menu of XO sauces that runs from a very mild, fruity "classic" for $8 to a $30 Super Premium made with abalone, truffle, dried scallop, saffron, jamon and gold leaf. 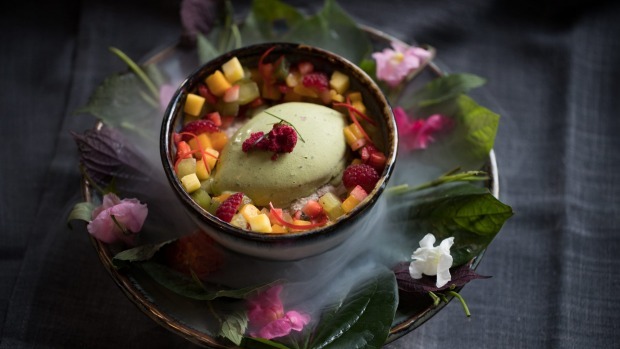 Like a crazy dessert of salted coconut and roasted rice pudding with green curry ice-cream, spilling over with clouds of liquid nitrogen ($19.50). I seriously thought that would be a step too far, but it was saved by the smooth, refreshing ice-cream. It's hard to escape the high-end food court feel on a big night, when the Chatswood Interchange's cheery resident jazz band comes oom-pah-pahing its way through the restaurant, but there's a likeable energy to dining here, and staff are many, varied, and friendly. Pressed prawn toasts ($14.50) are cutely served in wooden toast racks; slightly oily to the touch outside, but comfort-eating inside. Grilled head-on prawns ($8 each) are a surprise hit for the balance of their smooth laksa sauce. There's a tendency towards sweetness, and some dishes seem built more for visual impact than flavour, such as a lunar new year yee sang salad ($28), a dramatic kaleidoscope of raw salmon, diced vegetables, fruit and wonton crisps. Even tossed with its roasted sesame dressing, it's bland, and needs more oomph and acidity. The least mucked-about-with dish is the 24-hour braised pork belly ($42 to share), served at the table from its hot pot, along with lightly sweet Chinese-spiced master stock, chunky king mushrooms and thick slices of daikon; jasmine rice by the side. While it doesn't have that quivering dong po wobble, it's soft and layered with fat; a pleasant way to keep the party going for the year of the pig. It's also very happy in the same pen as a silky, complex 2017 Dalrymple pinot noir ($72) from Pipers River in Tasmania. Beneath all the bells and whistles, the cooking is lighter, fresher and quite possibly healthier than tradition would dictate. It's not Hong Kong by any means, but the General shares a similarly happy mix of influences, cultures and flavours, and a similar world position, poised in the mid-levels between the old world and the new. Vegetarian Good meat-free options from salt-and-pepper eggplant to mother-in-law's eggs, charred broccolini, charred corn and stir-fried greens. Drinks Orientified cocktails (Just a Dashi, Jean Claude Pandan) from PS40; Japanese, Vietnamese and local beers, sake by the glass, plus a lively, multicultural, hi-lo wine list running from a $43 Blackbilly GSM to a $399 Dom Perignon. Cost About $135 for two, plus drinks. Go-to dish Masterstock 24-hour braised belly pork, $42 to share. Pro tip If you need a big table, choose one of the two attractive private dining rooms. Terry Durack is chief restaurant critic for The Sydney Morning Herald and senior reviewer for the Good Food Guide. This rating is based on the Good Food Guide scoring system.